License, insurance, vehicle registration, options and sales taxes are extra. Lease payment must be performed monthly and cannot be made bi-weekly. Bi-weekly payment of $156.59 included in the ad is for advertising purposes only. Model shown is a 2019 MINI Cooper 3 door. All-inclusive starting price for a base model 2019 MINI Cooper 3 door is $27,626.00, which includes MSRP ($23,090.00), Freight/PDI ($2,135.00), MINI Classic Line ($1,300.00), and exterior paint colour ($590.00), retailer administration fee (up to $399.00), tire stewardship fee ($12.00), and A/C levy ($100.00). **Lease a 2019 MINI Cooper 3 door for $339.28 a month for 48 months at 1.99 %, includes MSRP ($23,090.00), freight/PDI ($2,135.00), MINI Classic Line ($1,300.00), and exterior paint colour ($590.00), less credit ($400.00). 16,000 km per year, $0.15/excess km. Down payment ($1,025.00), first month’s payment ($339.28), security deposit ($339.28), retailer administration fees (up to $399.00), A/C levy ($100.00), fees associated with RDPRM registration (up to $48.89), tire stewardship fee ($12.00), for a total of $2,263.44 due at lease inception. License, insurance, vehicle registration, and taxes are extra. ***Finance example based on $26,715.00 (MSRP, freight/PDI, MINI Classic Line, exterior paint colour, less down payment and applicable credits) financed at 0.99 % for 60 months. Cost of borrowing is $2,350.77 of credit charges, which includes the service fees associated with RDPRM registration (up to $48.89). Consumer’s total obligation is $25,440.77. License, insurance, vehicle registration, and sales taxes are extra. ****MSRP starting price for a base model 2019 MINI Cooper 3 door is $23,090.00. Freight/PDI ($2,135.00), retailer administration fee (up to $399.00), tire stewardship fee ($12.00), and A/C levy ($100.00) are extra. Lease payment must be performed monthly and cannot be made bi-weekly. Bi-weekly payment of $187.19 included in the ad is for advertising purposes only. Model shown is a 2019 MINI Cooper S 3 door. All-inclusive starting price for a base model 2019 MINI Cooper S 3 door is $31,926.00, which includes MSRP ($27,390.00), Freight/PDI ($2,135.00), MINI Classic Line ($1,300.00), and exterior paint colour ($590.00), retailer administration fee (up to $399.00), tire stewardship fee ($12.00), and A/C levy ($100.00). **Lease a 2019 MINI Cooper S 3 door for $405.57 a month for 48 months at 1.99 %, includes MSRP ($27,390.00), freight/PDI ($2,135.00), MINI Classic Line ($1,300.00), and exterior paint colour ($590.00), less credit ($500.00). 16,000 km per year, $0.15/excess km. Down payment ($550.00), first month’s payment ($405.57), security deposit ($405.57), retailer administration fees (up to $399.00), A/C levy ($100.00), fees associated with RDPRM registration (up to $48.89), tire stewardship fee ($12.00), for a total of $1,921.03 due at lease inception. License, insurance, vehicle registration, and taxes are extra. ***Finance example based on $30,915.00 (MSRP, freight/PDI, MINI Classic Line, exterior paint colour, less down payment and applicable credits) financed at 0.99 % for 60 months. Cost of borrowing is $2,343.36 of credit charges, which includes the service fees associated with RDPRM registration (up to $48.89). Consumer’s total obligation is $29,733.36. License, insurance, vehicle registration, and sales taxes are extra. ****MSRP starting price for a base model 2019 MINI Cooper S 3 door is $27,390.00. Freight/PDI ($2,135.00), retailer administration fee (up to $399.00), tire stewardship fee ($12.00), and A/C levy ($100.00) are extra. Lease payment must be performed monthly and cannot be made bi-weekly. Bi-weekly payment of $226.03 included in the ad is for advertising purposes only. Model shown is a 2019 MINI John Cooper Works 3 door. All-inclusive starting price for a base model 2019 MINI John Cooper Works 3 door is $39,326.00, which includes MSRP ($34,890.00), Freight/PDI ($2,135.00), MINI Classic Line ($1,200.00), and exterior paint colour ($590.00), retailer administration fee (up to $399.00), tire stewardship fee ($12.00), and A/C levy ($100.00). **Lease a 2019 MINI John Cooper Works 3 door for $489.72 a month for 48 months at 1.99 %, includes MSRP ($34,890.00), freight/PDI ($2,135.00), MINI Classic Line ($1,200.00), and exterior paint colour ($590.00), less credit ($750.00). 16,000 km per year, $0.15/excess km. Down payment ($950.00), first month’s payment ($489.72), security deposit ($489.72), retailer administration fees (up to $399.00), A/C levy ($100.00), fees associated with RDPRM registration (up to $48.89), tire stewardship fee ($12.00), for a total of $2,489.33 due at lease inception. License, insurance, vehicle registration, and taxes are extra. ***Finance example based on $38,065.00 (MSRP, freight/PDI, MINI Classic Line, exterior paint colour, less down payment and applicable credits) financed at 0.99 % for 60 months. Cost of borrowing is $2,292.49 of credit charges, which includes the service fees associated with RDPRM registration (up to $48.89). Consumer’s total obligation is $37,182.49. License, insurance, vehicle registration, and sales taxes are extra. ****MSRP starting price for a base model 2019 MINI John Cooper Works 3 door is $34,890.00. Freight/PDI ($2,135.00), retailer administration fee (up to $399.00), tire stewardship fee ($12.00), and A/C levy ($100.00) are extra. Lease payment must be performed monthly and cannot be made bi-weekly. Bi-weekly payment of $190.70 included in the ad is for advertising purposes only. Model shown is a 2019 MINI Cooper Convertible. All-inclusive starting price for a base model 2019 MINI Cooper Convertible is $34,126.00, which includes MSRP ($29,690.00), Freight/PDI ($2,135.00), MINI Classic Line ($1,200.00), and exterior paint colour ($590.00), retailer administration fee (up to $399.00), tire stewardship fee ($12.00), and A/C levy ($100.00). **Lease a 2019 MINI Cooper Convertible for $413.19 a month for 48 months at 1.99 %, includes MSRP ($29,690.00), freight/PDI ($2,135.00), MINI Classic Line ($1,200.00), and exterior paint colour ($590.00). 16,000 km per year, $0.15/excess km. Down payment ($550.00), first month’s payment ($413.19), security deposit ($413.19), retailer administration fees (up to $399.00), A/C levy ($100.00), fees associated with RDPRM registration (up to $48.89), tire stewardship fee ($12.00), for a total of $1,936.27 due at lease inception. License, insurance, vehicle registration, and taxes are extra. ***Finance example based on $33,615.00 (MSRP, freight/PDI, MINI Classic Line, exterior paint colour, less down payment and applicable credits) financed at 0.99 % for 60 months. Cost of borrowing is $2,918.19 of credit charges, which includes the service fees associated with RDPRM registration (up to $48.89). Consumer’s total obligation is $32,608.19. License, insurance, vehicle registration, and sales taxes are extra. ****MSRP starting price for a base model 2019 MINI Cooper Convertible is $29,690.00. Freight/PDI ($2,135.00), retailer administration fee (up to $399.00), tire stewardship fee ($12.00), and A/C levy ($100.00) are extra. Lease payment must be performed monthly and cannot be made bi-weekly. Bi-weekly payment of $210.08 included in the ad is for advertising purposes only. Model shown is a 2019 MINI Cooper S Convertible. All-inclusive starting price for a base model 2019 MINI Cooper S Convertible is $38,426.00, which includes MSRP ($33,990.00), Freight/PDI ($2,135.00), MINI Classic Line ($1,200.00), and exterior paint colour ($590.00), retailer administration fee (up to $399.00), tire stewardship fee ($12.00), and A/C levy ($100.00). **Lease a 2019 MINI Cooper S Convertible for $455.17 a month for 48 months at 1.99 %, includes MSRP ($33,990.00), freight/PDI ($2,135.00), MINI Classic Line ($1,200.00), and exterior paint colour ($590.00). 16,000 km per year, $0.15/excess km. Down payment ($1,200.00), first month’s payment ($455.17), security deposit ($455.17), retailer administration fees (up to $399.00), A/C levy ($100.00), fees associated with RDPRM registration (up to $48.89), tire stewardship fee ($12.00), for a total of $2,670.23 due at lease inception. License, insurance, vehicle registration, and taxes are extra. ***Finance example based on $37,915.00 (MSRP, freight/PDI, MINI Classic Line, exterior paint colour, less down payment and applicable credits) financed at 0.99 % for 60 months. Cost of borrowing is $3,031.07 of credit charges, which includes the service fees associated with RDPRM registration (up to $48.89). Consumer’s total obligation is $37,021.07. License, insurance, vehicle registration, and sales taxes are extra. ****MSRP starting price for a base model 2019 MINI Cooper S Convertible is $33,990.00. Freight/PDI ($2,135.00), retailer administration fee (up to $399.00), tire stewardship fee ($12.00), and A/C levy ($100.00) are extra. Lease payment must be performed monthly and cannot be made bi-weekly. Bi-weekly payment of $259.25 included in the ad is for advertising purposes only. Model shown is a 2019 MINI John Cooper Works Convertible. All-inclusive starting price for a base model 2019 MINI John Cooper Works Convertible is $45,726.00, which includes MSRP ($41,490.00), Freight/PDI ($2,135.00), MINI Classic Line ($1,000.00), and exterior paint colour ($590.00), retailer administration fee (up to $399.00), tire stewardship fee ($12.00), and A/C levy ($100.00). **Lease a 2019 MINI John Cooper Works Convertible for $561.71 a month for 48 months at 1.99 %, includes MSRP ($41,490.00), freight/PDI ($2,135.00), MINI Classic Line ($1,000.00), and exterior paint colour ($590.00). 16,000 km per year, $0.15/excess km. Down payment ($500.00), first month’s payment ($561.71), security deposit ($561.71), retailer administration fees (up to $399.00), A/C levy ($100.00), fees associated with RDPRM registration (up to $48.89), tire stewardship fee ($12.00), for a total of $2,183.31 due at lease inception. License, insurance, vehicle registration, and taxes are extra. ***Finance example based on $45,215.00 (MSRP, freight/PDI, MINI Classic Line, exterior paint colour, less down payment and applicable credits) financed at 0.99 % for 60 months. Cost of borrowing is $3,221.32 of credit charges, which includes the service fees associated with RDPRM registration (up to $48.89). Consumer’s total obligation is $44,711.32. License, insurance, vehicle registration, and sales taxes are extra. ****MSRP starting price for a base model 2019 MINI John Cooper Works Convertible is $41,490.00. Freight/PDI ($2,135.00), retailer administration fee (up to $399.00), tire stewardship fee ($12.00), and A/C levy ($100.00) are extra. Lease payment must be performed monthly and cannot be made bi-weekly. Bi-weekly payment of $202.72 included in the ad is for advertising purposes only. **Lease a 2019 MINI Cooper Countryman ALL4 for $439.22 a month for 48 months at 1.99 %, includes MSRP ($31,090.00), freight/PDI ($2,135.00), MINI Classic Line ($1,800.00), and exterior paint colour ($590.00), less credit ($500.00). 16,000 km per year, $0.15/excess km. Down payment ($1,050.00), first month’s payment ($439.22), security deposit ($439.22), retailer administration fees (up to $399.00), A/C levy ($100.00), fees associated with RDPRM registration (up to $48.89), tire stewardship fee ($12.00), for a total of $2,488.33 due at lease inception. License, insurance, vehicle registration, and taxes are extra. ****MSRP starting price for a base model 2019 MINI Cooper Countryman ALL4 is $31,090.00. Freight/PDI ($2,135.00), retailer administration fee (up to $399.00), tire stewardship fee ($12.00), and A/C levy ($100.00) are extra. Lease payment must be performed monthly and cannot be made bi-weekly. Bi-weekly payment of $219.91 included in the ad is for advertising purposes only. Model shown is a 2019 MINI Cooper S Countryman ALL4. All-inclusive starting price for a base model 2019 MINI Cooper S Countryman ALL4 is $39,126.00, which includes MSRP ($34,090.00), Freight/PDI ($2,135.00), MINI Classic Line ($1,800.00), and exterior paint colour ($590.00), retailer administration fee (up to $399.00), tire stewardship fee ($12.00), and A/C levy ($100.00). **Lease a 2019 MINI Cooper S Countryman ALL4 for $476.47 a month for 48 months at 1.99 %, includes MSRP ($34,090.00), freight/PDI ($2,135.00), MINI Classic Line ($1,800.00), and exterior paint colour ($590.00), less credit ($600.00). 16,000 km per year, $0.15/excess km. Down payment ($900.00), first month’s payment ($476.47), security deposit ($476.47), retailer administration fees (up to $399.00), A/C levy ($100.00), fees associated with RDPRM registration (up to $48.89), tire stewardship fee ($12.00), for a total of $2,412.83 due at lease inception. License, insurance, vehicle registration, and taxes are extra. ***Finance example based on $38,015.00 (MSRP, freight/PDI, MINI Classic Line, exterior paint colour, less down payment and applicable credits) financed at 0.99 % for 60 months. Cost of borrowing is $2,419.66 of credit charges, which includes the service fees associated with RDPRM registration (up to $48.89). Consumer’s total obligation is $36,509.66. License, insurance, vehicle registration, and sales taxes are extra. ****MSRP starting price for a base model 2019 MINI Cooper S Countryman ALL4 is $34,090.00. Freight/PDI ($2,135.00), retailer administration fee (up to $399.00), tire stewardship fee ($12.00), and A/C levy ($100.00) are extra. Lease payment must be performed monthly and cannot be made bi-weekly. Bi-weekly payment of $242.63 included in the ad is for advertising purposes only. Model shown is a 2019 MINI John Cooper Works Countryman ALL4. All-inclusive starting price for a base model 2019 MINI John Cooper Works Countryman ALL4 is $44,826.00, which includes MSRP ($39,790.00), Freight/PDI ($2,135.00), MINI Classic Line ($1,800.00), and exterior paint colour ($590.00), retailer administration fee (up to $399.00), tire stewardship fee ($12.00), and A/C levy ($100.00). **Lease a 2019 MINI John Cooper Works Countryman ALL4 for $525.69 a month for 48 months at 1.99 %, includes MSRP ($39,790.00), freight/PDI ($2,135.00), MINI Classic Line ($1,800.00), and exterior paint colour ($590.00), less credit ($1,500.00). 16,000 km per year, $0.15/excess km. Down payment ($900.00), first month’s payment ($525.69), security deposit ($525.69), retailer administration fees (up to $399.00), A/C levy ($100.00), fees associated with RDPRM registration (up to $48.89), tire stewardship fee ($12.00), for a total of $2,511.28 due at lease inception. License, insurance, vehicle registration, and taxes are extra. ***Finance example based on $42,815.00 (MSRP, freight/PDI, MINI Classic Line, exterior paint colour, less down payment and applicable credits) financed at 0.99 % for 60 months. Cost of borrowing is $1,640.15 of credit charges, which includes the service fees associated with RDPRM registration (up to $48.89). Consumer’s total obligation is $41,430.15. License, insurance, vehicle registration, and sales taxes are extra. ****MSRP starting price for a base model 2019 MINI John Cooper Works Countryman ALL4 is $39,790.00. Freight/PDI ($2,135.00), retailer administration fee (up to $399.00), tire stewardship fee ($12.00), and A/C levy ($100.00) are extra. Lease payment must be performed monthly and cannot be made bi-weekly. Bi-weekly payment of $166.94 included in the ad is for advertising purposes only. Model shown is a 2019 MINI Cooper 5 door. All-inclusive starting price for a base model 2019 MINI Cooper 5 door is $28,926.00, which includes MSRP ($24,390.00), Freight/PDI ($2,135.00), MINI Classic Line ($1,300.00), and exterior paint colour ($590.00), retailer administration fee (up to $399.00), tire stewardship fee ($12.00), and A/C levy ($100.00). **Lease a 2019 MINI Cooper 5 door for $361.70 a month for 48 months at 1.99 %, includes MSRP ($24,390.00), freight/PDI ($2,135.00), MINI Classic Line ($1,300.00), and exterior paint colour ($590.00), less credit ($400.00). 16,000 km per year, $0.15/excess km. Down payment ($725.00), first month’s payment ($361.70), security deposit ($361.70), retailer administration fees (up to $399.00), A/C levy ($100.00), fees associated with RDPRM registration (up to $48.89), tire stewardship fee ($12.00), for a total of $2,008.30 due at lease inception. License, insurance, vehicle registration, and taxes are extra. ***Finance example based on $28,015.00 (MSRP, freight/PDI, MINI Classic Line, exterior paint colour, less down payment and applicable credits) financed at 0.99 % for 60 months. Cost of borrowing is $2,374.87 of credit charges, which includes the service fees associated with RDPRM registration (up to $48.89). Consumer’s total obligation is $26,764.87. License, insurance, vehicle registration, and sales taxes are extra. ****MSRP starting price for a base model 2019 MINI Cooper 5 door is $24,390.00. Freight/PDI ($2,135.00), retailer administration fee (up to $399.00), tire stewardship fee ($12.00), and A/C levy ($100.00) are extra. Lease payment must be performed monthly and cannot be made bi-weekly. Bi-weekly payment of $191.66 included in the ad is for advertising purposes only. Model shown is a 2019 MINI Cooper S 5 door. All-inclusive starting price for a base model 2019 MINI Cooper S 5 door is $33,226.00, which includes MSRP ($28,690.00), Freight/PDI ($2,135.00), MINI Classic Line ($1,300.00), and exterior paint colour ($590.00), retailer administration fee (up to $399.00), tire stewardship fee ($12.00), and A/C levy ($100.00). **Lease a 2019 MINI Cooper S 5 door for $415.27 a month for 48 months at 1.99 %, includes MSRP ($28,690.00), freight/PDI ($2,135.00), MINI Classic Line ($1,300.00), and exterior paint colour ($590.00), less credit ($500.00). 16,000 km per year, $0.15/excess km. Down payment ($850.00), first month’s payment ($415.27), security deposit ($415.27), retailer administration fees (up to $399.00), A/C levy ($100.00), fees associated with RDPRM registration (up to $48.89), tire stewardship fee ($12.00), for a total of $2,240.42 due at lease inception. License, insurance, vehicle registration, and taxes are extra. ***Finance example based on $32,215.00 (MSRP, freight/PDI, MINI Classic Line, exterior paint colour, less down payment and applicable credits) financed at 0.99 % for 60 months. Cost of borrowing is $2,386.48 of credit charges, which includes the service fees associated with RDPRM registration (up to $48.89). Consumer’s total obligation is $31,076.48. License, insurance, vehicle registration, and sales taxes are extra. ****MSRP starting price for a base model 2019 MINI Cooper S 5 door is $28,690.00. Freight/PDI ($2,135.00), retailer administration fee (up to $399.00), tire stewardship fee ($12.00), and A/C levy ($100.00) are extra. Lease payment must be performed monthly and cannot be made bi-weekly. Bi-weekly payment of $187.11 included in the ad is for advertising purposes only. Model shown is a 2019 MINI Cooper Clubman ALL4. All-inclusive starting price for a base model 2019 MINI Cooper Clubman ALL4 is $33,226.00, which includes MSRP ($28,690.00), Freight/PDI ($2,135.00), MINI Classic Line ($1,300.00), and exterior paint colour ($590.00), retailer administration fee (up to $399.00), tire stewardship fee ($12.00), and A/C levy ($100.00). **Lease a 2019 MINI Cooper Clubman ALL4 for $405.41 a month for 48 months at 1.99 %, includes MSRP ($28,690.00), freight/PDI ($2,135.00), MINI Classic Line ($1,300.00), and exterior paint colour ($590.00), less credit ($500.00). 16,000 km per year, $0.15/excess km. Down payment ($775.00), first month’s payment ($405.41), security deposit ($405.41), retailer administration fees (up to $399.00), A/C levy ($100.00), fees associated with RDPRM registration (up to $48.89), tire stewardship fee ($12.00), for a total of $2,145.72 due at lease inception. License, insurance, vehicle registration, and taxes are extra. ***Finance example based on $32,215.00 (MSRP, freight/PDI, MINI Classic Line, exterior paint colour, less down payment and applicable credits) financed at 0.99 % for 60 months. Cost of borrowing is $2,382.68 of credit charges, which includes the service fees associated with RDPRM registration (up to $48.89). Consumer’s total obligation is $31,072.68. License, insurance, vehicle registration, and sales taxes are extra. ****MSRP starting price for a base model 2019 MINI Cooper Clubman ALL4 is $28,690.00. Freight/PDI ($2,135.00), retailer administration fee (up to $399.00), tire stewardship fee ($12.00), and A/C levy ($100.00) are extra. Lease payment must be performed monthly and cannot be made bi-weekly. Bi-weekly payment of $202.06 included in the ad is for advertising purposes only. Model shown is a 2019 MINI Cooper S Clubman ALL4. 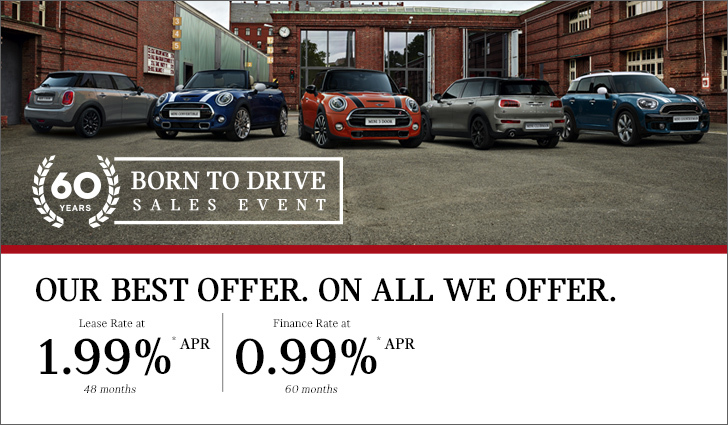 All-inclusive starting price for a base model 2019 MINI Cooper S Clubman ALL4 is $36,226.00, which includes MSRP ($31,690.00), Freight/PDI ($2,135.00), MINI Classic Line ($1,300.00), and exterior paint colour ($590.00), retailer administration fee (up to $399.00), tire stewardship fee ($12.00), and A/C levy ($100.00). **Lease a 2019 MINI Cooper S Clubman ALL4 for $437.79 a month for 48 months at 1.99 %, includes MSRP ($31,690.00), freight/PDI ($2,135.00), MINI Classic Line ($1,300.00), and exterior paint colour ($590.00), less credit ($600.00). 16,000 km per year, $0.15/excess km. Down payment ($850.00), first month’s payment ($437.79), security deposit ($437.79), retailer administration fees (up to $399.00), A/C levy ($100.00), fees associated with RDPRM registration (up to $48.89), tire stewardship fee ($12.00), for a total of $2,285.47 due at lease inception. License, insurance, vehicle registration, and taxes are extra. ***Finance example based on $35,115.00 (MSRP, freight/PDI, MINI Classic Line, exterior paint colour, less down payment and applicable credits) financed at 0.99 % for 60 months. Cost of borrowing is $2,367.66 of credit charges, which includes the service fees associated with RDPRM registration (up to $48.89). Consumer’s total obligation is $34,057.66. License, insurance, vehicle registration, and sales taxes are extra. ****MSRP starting price for a base model 2019 MINI Cooper S Clubman ALL4 is $31,690.00. Freight/PDI ($2,135.00), retailer administration fee (up to $399.00), tire stewardship fee ($12.00), and A/C levy ($100.00) are extra.